Bread buffs, get excited: Two chewy food holidays have landed on Feb. 9. 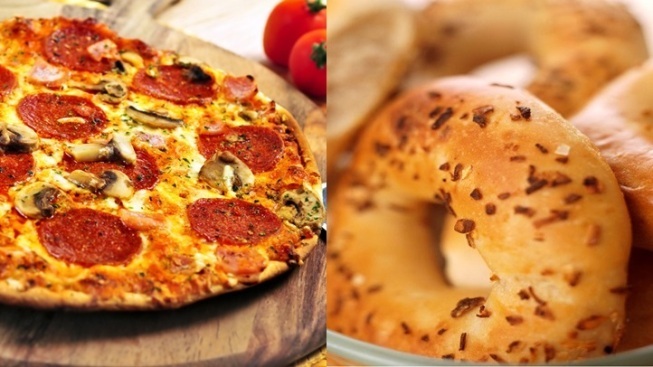 Tuesday, Feb. 9 is National Pizza Day and National Bagel Day. Truly. Holidays aren't occasions that ever stand strictly alone. Sometimes a birthday will land on Halloween or the Fourth of July, or the first day of school will converge with a town's historic founding day. In short, nobody advocates selfishness in terms of what days can highlight what celebratory matters. That said, everyone gets a tad selfish over the last slice of pizza in the box, and the final bagel half in the bowl, especially if it is the top half of the bagel, the one covered with a hefty smattering of onions or salt or cinnamon sugar. So that National Pizza Day and National Bagel Day should arrive on the very same day -- Tuesday, Feb. 9 -- feels right and good and almost as though the mysterious, hard-to-harness forces of the universe are in order. Western Bagel: The NYC-style, fill-the-tummy bagels have been a Los Angeles favorite for well over a half century, and each week a special is posted, the better to give the savings back to the fans. The special for the week in which National Bagel Day falls? One dozen bagels and two small flavored cream cheeses for $13.95. Just be sure to have the offer ready to show on your phone. Pizza classics: A number of coupons for national chains, from Papa John's to Domino's to Pizza Hut, can be found at major money-saving outlets like Retail Me Not and Deal Catcher. But maybe supporting a local joint on #NationaPizzaDay -- hello, Village Pizzeria or Deano's Pizza or the hundreds of started-in-SoCal pie shops -- is your ticket to honoring one of the best foodstuffs in the solar system and the people who make it. A slice is still one of the best bargains around, whether it is National Pizza Day or not. Fact. Still, there are other pizza holidays on the calendar, like National Cheese Pizza Day in the fall, so don't give up on more deals to come. And another bready, chewy, round 'n batter-yum icon will make its annual holiday showing in just a few weeks, when National Pancake Day arrives. The deals there start famously at IHOP, so best get to planning your syrupy savings now.